As was the case with the 2010 Cancún climate negotiations, the parties to the G20 seemed not to be troubled to be the guests of Felipe Calderón’s PAN government, responsible as it is for the deaths now of more than 60,000 Mexicans since the initiation of the current president’s highly militarized war strategy against particular drug cartels (but not all of them).1 In this is once again seen the total moral bankruptcy of the transnational capitalist class and its State protectors—the same ones who have agreed to meet next December at the invitation of the super-reactionary Qatari dictatorship to pretend to continue discussing how they might address the ever-more severe climate crisis. Following the established pattern, no indication was made by G20 member-governments that they were at all cognizant of the International Energy Agency’s recently published findings on greenhouse-gas emissions in 2011, which broke the previously established historical record of 2010, that the atmospheric carbon concentration has now reached 400 parts per million in the Arctic regions, or that the the highly respected Nature now reports depressingly that environmental collapse is indeed a possibility within a generation or two, given prevailing trends. But enough of analyzing the priorities of l@s de arriba: these are clear enough for anyone to see; they consign humanity to oblivion, as John Holloway writes succintly and correctly.2 The point it would seem should be to focus one’s efforts on analyzing responses and challenges from below to capitalism’s destructiveness and brutality. 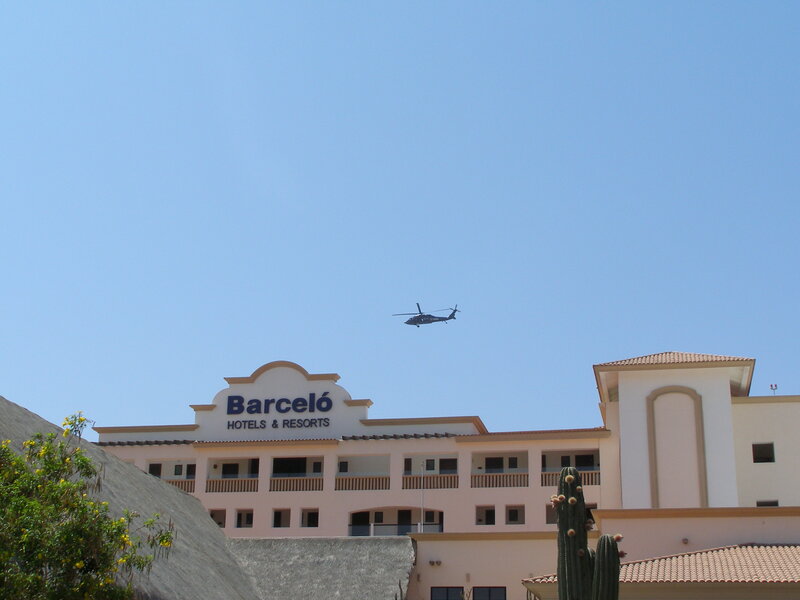 Sadly, there was shockingly little of this seen in Baja California Sur around the dates of 18-19 June, when the G20 was meeting in the luxury hotel El Barcelón and others on the beach of San José. In this sense, the resistance to the G20 in Los Cabos was not that seen in Cancún against COP-16 , let alone in Seattle against the World Trade Organization in 1999, or the mobilizations against the G8 in Genoa in 2001. True enough, there was organized an Alternative Meeting of the People against the G20 (Cumbre de los Pueblos frente al G20) in La Paz, some 160 km north of San José del Cabo, which was hosted at the offices of different labor unions (telephone workers and teachers) and saw mostly male-dominated panels examining various aspects of the multidimensional crisis for which the G20 is principally responsible—capital flow, official corruption, the condition of the working classes—but the event was poorly attended, as far as this writer could see, and it seemed ineluctably beholden to reformist/social-democratic approaches to the crises of capitalism. The autonomist-anarchist Mexican youth groupings who intervened so prominently at the Cancún COP were glaringly (and sadly) absent from the scene in Baja California. Apparently, they had previously planned to come and organize a radical counter-summit to the G20, but they opted instead to hold protests and mobilizations in central Mexico parallel to the meeting of the G20, following with the previously planned outline of “indignation, mobilization, occupation, agitation, popular assembly, blockade of capital flow, [and] direct action.” These protests in Mexico City included an event entitled “Culture against Capitalism” as well as a decolonial caravan that traveled through Mexico state, Puebla, and Tlaxcala. In light of these developments, it cannot immediately thus be said that resistance to the G20 was limited entirely to the talking shops of La Paz, and this is not to call into question the strategy of these anarchists, but it might perhaps have been more satisfying to have seen more direct forms of confrontation to the death-drive being impelled by the global oligarchy in Los Cabos, rather than just let it and the Mexican security forces continue with their absurdities unimpeded. This is not of course to overlook the question of monetary cost in traveling from central Mexico to Baja California Sur, nor is it to deny that Los Cabos itself is, like Cancún, located in a rather remote region of the country—thus it is unsurprising that the oligarchy would choose such a site for its 2012 meeting. Yet despite the alternative summit at La Paz and the resistance seen in and around Mexico City, George Monbiot is right to raise the question of “where is everyone?” While anti-systemic thought and action have progressed considerably in the past two years, given the revolts in the Arab-majority world, the mobilizations throughout much of Europe, and the Occupy/Decolonize movement in the U.S., it is not necessarily the case that Theodor W. Adorno’s “global self-conscious subject” is developing, in Hegelian terms, to such a point that it could—perhaps by a sustained worldwide general strike—threaten the rule of capital and the State; perhaps people in general are too consumed with labor, family commitments, and the culture industry. And so the catastrophe-conflagration continues inexorably: thus will it ever be, as Subcomandante Insurgente Marcos writes, until—and unless—a wind from below develops and comes finally and radically to overturn insanity and world-destruction. 1See John Gibler, To Die in Mexico (San Francisco: City Lights Books, 2011). 2John Holloway, Crack Capitalism (London: Pluto, 2010). This entry was posted on June 23, 2012 at 8:16 pm and is filed under 'development', Abya Yala, anarchism, climate catastrophe, COP, displacement, imperialism, México, reformism, requiems, war. You can follow any responses to this entry through the RSS 2.0 feed. You can leave a response, or trackback from your own site.